Luxury YACHT CLUB VILLA. Ideal location for yachting, golf and beaches. 5 double bedrooms with 5 en-suite bathrooms + day toilet. Sleeps 10 in comfort. Villa Maricel is a very spacious ( +500 m2 constructed area), Mediterranean designer villa in the PRIME property part of South West of Mallorca, Spain. With a private pool plus a separate hot tub jacuzzi pool and mature gardens, on a quiet, picturesque marina, it offers luxurious accommodation for ten guests in five spacious bedrooms each with a bathroom ensuite. 3 minutes walking to the beach, 15 minutes drive to Palma, 5 min to a choice of four golf courses, tennis, restaurants and, shopping. 25 Minutes to the airport. The villa has large open interior areas and is finished to high standards with marble floors and marble bathrooms. - One semi-shaded courtyard terrace (about 30m2) just outside the main kitchen with a large dining table. - A sunny terrace on the lower level next to the pool also with dining table. - A fourth is a 30m2 pad overlooking the yacht club. - A fifth is a natural stone terrace next to the decorative pond pool surrounded by subtropical plants. There is a large oak table in the main kitchen with seating for six. There is a second living room downstairs next to the main pool. The villa has direct access to the yacht club through a private gate at the bottom of the garden. Just three minutes walking from the villa, there is a small cove with a sandy beach and calm water. At the same distance, there is a ladder off the rocks and a tiny cove where you can snorkel in the transparent blue water and then lie on the rocks and enjoy the sun and spectacular view of the bay. A little further away is the main beach of Santa Ponsa, which is very big, with white sand and a large pine-wooded area behind where you can get out of the sun. Sunbeds and umbrellas are available here in the summer. There are much more beaches in the area and around Mallorca, one to suit every taste. Santa Ponsa is a resort town centered on a large sandy beach at the top of a wide bay. The villa is located in a quiet residential part of Santa Ponsa, far enough away from the commercial center to escape the hustle and bustle but close enough (10 min) to walk for restaurants and nightlife. The adjacent yacht club has an Italian restaurant, international cuisine restaurant, sports bar restaurant and a diving school. Palma is only 15 min drive away and offers a rich mix of history, culture , and nightlife with Art Nouveau buildings, turn of the century coffee houses, galleries, restaurants and shopping that are the equal of any other big city in Spain. Palma was recently voted by THE TIMES as the most desirable city to live in with the best mix of quality of life. The villa is also very suitable for two families. Some come with or without children to share the pleasure and cost. For small children, we do highly recommend constant parental supervision when the children are near the areas of the two pools, especially if the children can not swim. For children that can not swim we insist that the children wear appropriate life vests in addition to parental supervision near or in the pool areas. A tragedy can happen quickly. A baby that cannot swim will actually sink, thus we demand parents take appropriate measures to prevent any such thing. Please note that for rentals of seven nights or fewer in the PRIME season, unfortunately, an extra fee of EUR 390 will have to be charged to support additional staff during an urgent changeover. There will only be a short time between changeovers in PRIME season, and we will, unfortunately, have extra costs to get the job done ultra quick and properly. For rentals of 8 days and over the cleaning fee will be included in the price. We thank you for your understanding. The villa is for sale, and we are aware that this may be a deterrent for people that wish to book a rental a long time ahead. However, we know the local market well and in the unfortunate case of a sale happening before the reserved dates, we will be pleased to find a replacement villa. Also in case of a cancellation due to a sale, we will instantly return the deposit AND pay the same amount in addition as liquidated damages. This extra budget will make it easier both of us to find you a replacement villa. Please ask us for more details. The local ECO tax is already included in the rental fees. We can probably accept your pet - please enquire for further details. Any rental or lease transaction concerning this property will be subject to Spanish law 29/1994 LAU and subject to contract. This Tourist rental license is required for any holiday rental in the Balearic islands. TIP: If a DRIAT license reference is not mentioned on the advertised display the property may be advertised illegally. Please insist on asking the DRIAT tourist license reference before you book ANY property. There are still unlicensed properties and you don't want to be caught in the middle of a Government illegal rental crackdown with consequences. The energy rating of the property is D.
All given measurements are believed to be correct but are approximate. You are welcome to personally inspect the property and check all the details before you make a commitment - in some cases, if it is a multiple week rental, we do recommend and prefer you to inspect the property before you commit. Like you wish to view the property, we would also be delighted to meet the people who are going to spend multiple weeks in our home. This will make sure that realistic expectations of both sides are met and avoids possible misunderstandings and conflicts. With any rental, we require for an EUR 2000 security deposit to be paid prior to the rental and held on account for possible damages. We are very pleased to say that since 2003 when we joined HomeAway (formerly OwnersDirect), we have never had to retain a security deposit or even part of it. We also never had any disputes or disagreements with tenants. Our primary objective is to provide excellent accommodation, so that you can have a fantastic vacation. Details provide on this listing are believed to be correct and are provided in good faith but can not be used for a contract. We are in the superyacht charter and sales business and used to demanding clients. We are proud HomeAway owner members since 2003. We take deep pride into our excellent track record and know how to look after our property and guests. The villa is in a quiet location on a one-way street, yet it is on the waterfront and only minutes walk from activities, beaches and restaurants. For those that love golf, there is a choice of four courses within a five minute drive from the villa. For those that love yachting, bring your own boat and moor it in front of or near the villa. There are many different places and terraces (5) around the villa "to get your own space". The pool also has a Jacuzzi area. There is also a separate Hot Tub Jacuzzi pool. The location is one of the best of the island for beach, golf and yachting. There are few places that offer all this and are still relatively near a town where you can stroll to within a few minutes in order to get your international newspaper and a coffee on a nice terrace or beach bar. The kids are safe. The property is completely surrounded. There are neighbors but you can hardly see or hear them. The very mature garden provides a high level of privacy and shade where you need it. PRIME location, location, location for yachting, beaches and golf. All the ingredients for an unforgettable holiday and plenty of activities during all seasons. It takes a 10-minute stroll towards the main beach and city center. Mallorca is a fantastic place for hiking in all seasons. Many of our guests that visit in shoulder season, love to hike. Our YACHT CLUB VILLA is located right on the water, within a yacht club. It is ideal for people that love boats and yachting. Floor heating throughout the villa. In addition there is heating through fancoils to preheat the villa + an excellent JOTUL fireplace. There is ample place for parking on the street or in the garage. The exterior parking can cater for two large cars or three small cars. There are two living rooms. The main one is upstairs and the second one adjacent to the primary pool. In addition to two dining areas inside, there are three exterior dining areas. A 55 inch TV in the main living room with Google Chromecast that can play your NETFLIX, YouTube, International TV streaming and other personal content from your phone, tablet or computer. Bluetooth BOSE system and amplifier equiped with Google chromecast so that you can play all your personal music. There is a large selection of books in the English language available. Google chromecast available, so you can play all your personal films from your NETFLIX account and your personal music streaming accounts. The garden is fully enclosed and adjacent to the yacht club. The yacht club can be accessed directly through a private access door from the garden. The upper living room also has a large covered seating and dining area. Kayaks and paddleboards are available for rent within the yacht club area from the ZOEA diving school. Bicycles are optional and can be arranged subject to availability. There are boats for rent in the yacht club area. Adjacent to the main living room is a covered veranda with a seating area and a dining area. There are about 400 square meters of terraces on the property, including a 170 square meter roof terrace. Optional equipment can be arranged - please let us know what you want and give us reasonable notice. Public tennis courts are are available within a five minute drive. All rooms have air conditioning, marble floors, overhead fans, underfloor heating, and TV connection. Pets may be considered but must ask first. Heated Pool. Due to changes in local legislation, we may only use an URBAN rental contract. Optional housekeeping can be arranged. If you want a babysitter or chef etc. please give us reasonable notice for us to introduce people that you may be able to contract and pay directly, if you so desire. Unbelievably wonderful, relaxing, and well equipped property!! Our 6 day stay in Mallorca was absolutely fantastic! This property had everything we could ever want or need! Every outdoor space was beautiful and relaxing and well equipped with chairs, tables, umbrellas for shade, BBQ and the grounds beautifully maintained! Inside was beautiful too with spacious, tastefully appointed rooms and clean surroundings! Again, everything that you need to comfortably make this your home away from home was available. The owners were delightful, knowledgeable, and extremely helpful in answering our tourist questions! THANK YOU for a great time! Many thanks for your review. We also very much appreciated having you and your friends as our guests. We put in a lot of work to maintain and constantly upgrade the property and try very hard to have our guests comfortable and happy . We very much appreciate your comments. We are very pleased that your family had a very enjoyable stay and would like to thank you for your kind words. We were two families that spent our summer holiday in the house. The barbeque area had a nice view with fantastic sunsets. It was nice with two swimming pools. The youths were very satisfied with the big roof terrace. It was walking distance to Santa Ponca and the beach. And it was not to far from Palma, which is a very nice city. Everybody was very satisfied with the stay. Many thanks for your review. This is much appreciated and we hope that it won't be long for you to come back to our fantastic island soon. Lovely , luxury place and lovely House owner. A place to recommand to make beautiful holidays with family. Very beautiful House , two pools and garden. Very clean house and garden and beautiful style. A lot of possibilities for aquatic activites and amazing beaches all around the island. Absolutely recomanable. Very nice and well kept property. The area is very quiet, and good for relaxation. We arrived late in the evening, and we were met by one of the owners. She showed us all we needed to know, and the villa excceded our expectations by far. The owners did all they could to make our stay as pleasant as possible. Everything is nice and clean, including the two swimming pools. We were two families (10 persons), and there is plenty of room for that. We enjoyed the nice garden and pools with plenty of places to stay in the shadow during the highest sun intensity. Perfect location if you like it quiet and peacefull . Santa Ponca is only 10-15 min walk away. The beach there is very nice. We tried the restaurants located in the marina, and this was definately the best meal we had during our Mallorca stay. There is a scuba company in the marina, and we booked a snorkeling trip there. Lots of fun for the whole family, and definately worth doing. We were very satisfied with the service, the owners, the location and the villa. Definately a place we will rent again. Many thanks for your kind words and genuine appreciation. We would love to have you back again soon. 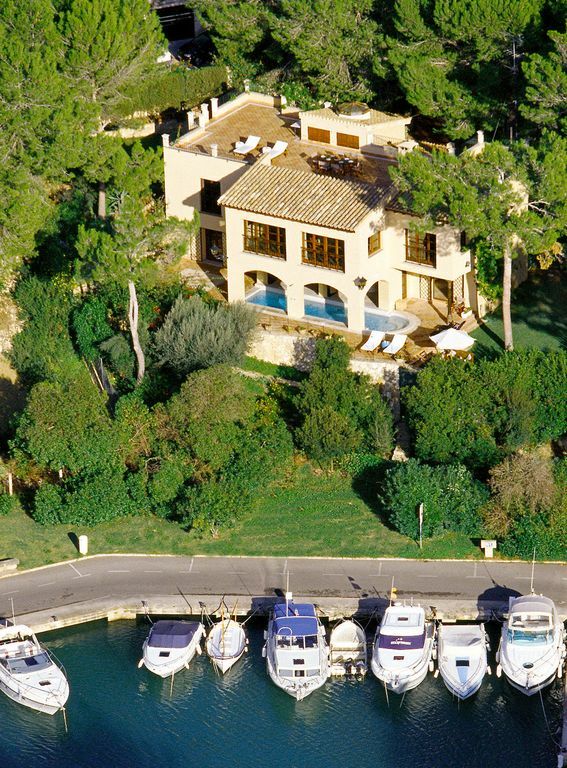 The villa is located first line on the waterfront within the quiet Santa Ponsa Yacht Club. The bottom gate opens up into the yacht club. Santa Ponsa is a sea-fronted village in southwest Mallorca about halfway between Andratx and Palma (18 Km). The South West is considered THE PRIME location for property on the island. Santa Ponsa has two beaches, four 18 hole golf courses, two marina’s and a tennis club all within 5 min. of the villa. 10 min drive will take you to the pretty fishing village of Andratx, elegant Puerto Portals, chic Philippe Starck designed Puerto Adriano or the old Mallorquin village of Calvia. Golf: The Santa Ponsa golf course has been played by the rich and famous including Severiano Ballesteros, Nigel Mansell, Prince Andrew and Michael Douglas & Catherine Zeta Jones. Santa Ponsa 1 golf course is just just 5 minutes drive from the villa. This has a wide gently sloping but demanding course with beautiful scenery and water hazards on five holes. It has been used for the Balearic Open ( PGA Tour ) on several occasions. There are three other golf courses in Santa Ponsa and others in the surrounding area, within a five minute drive from the villa. The beaches are very close. The nearest one is only a three minute walk and the main beach of Santa Ponsa is a ten-minute walk, without hills. The video on display was taken at the end of August in 2017. The DRIAT tourist licence is in compliance. The villa is offered for sale. For details please enquire. In compliance with local legislation, the villa may be offered for short-term rentals under an urban rental contract. The villa is in compliance with the DRIAT tourist rental license.